THIS DRESS SOLD. CONTACT SALES@BRIDESFORACAUSE.COM WITH INQUIRIES. Katie May's Vienna gown is made with french Chantilly lace and showcases a gorgeous cascading flutter sleeve, eyelash scallop trim detail at neckline, back, sleeve and hem as well as the designer's signature open back! We have one size available in an 8. 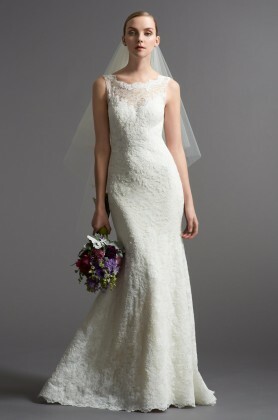 This dress was a sample gown that was donated by Katie May in LA to our charity bridal store. It is in excellent condition. The dress retail for $2900 and we're selling them for $1300! Contact Brides for a Cause to get your brand new low-back wedding dress a the fraction of the price!